If you’re planning some globetrotting, you can use your iPad to help you book trips, plan your vacation, and figure out what the weather’s like — where you are, or anywhere in the world. 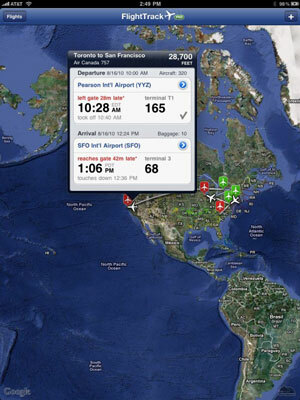 FlightTrack Pro’s main purpose is to track flights, in real time, with updated statuses, or even on a map. How cool is that? In addition, it pushes alerts out to you for changes in flight information — and remembers the flights you’ve entered so that you don’t have to enter them again. The app also offers integration with TripIt to fetch your personal flight itineraries automagically without your having to enter a thing. When you specify a flight, you see an overlay with the terminals, gate numbers, arrival and departure times, and even the baggage claim carousel. 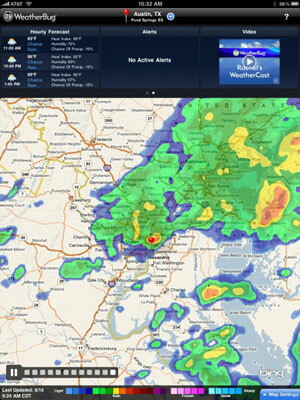 WeatherBug Elite provides temperatures, weather conditions, forecasts (seven-day and hourly! ), alerts from the National Weather Service, access to live weathercams, cached information for viewing offline, satellite and radar maps . . . and the list goes on. The Maps Settings menu lets you choose to display Doppler Radar (shown in this figure), satellite imagery, and other variables such as temperature, humidity, and pressure levels, as overlays on the map. The KAYAK HD app lets you search hundreds of travel sites faster and easier than visiting the Kayak site with Safari on your iPad, and it makes sorting, filtering, and comparing travel prices easy and fun. Be sure you check out the Explore button, which lets you specify a date range, activities you like (such as golf, skiing, gambling, and such), climate, maximum flight time, and price range — and then the app displays your options on a map! No matter where you are, if you need to find a Wi-Fi hotspot, you need WiFiGet HD. This clever app has over 150,000 free Wi-Fi hotspots pre-installed, so you can search for a hotspot without an Internet connection. And when you do have a wireless connection, it can access a database with over 200,000 free and paid hotspots. Of course, you can search for hotspots near your current location, but you can also search for them by address or by scrolling the map and looking for green pins (free hotspots) or red pins (paid hotspots). It’s always a challenge to find nearby points of interest. But Wikihood and Wikihood Plus are chock-full of interesting facts about schools, museums, parks, churches, cities, historic locations, and much more. The app is also easy to use: You can either tap the compass button to find sights near your current location or use the search function to find sights near somewhere you’re going. You can list places of interest by distance, relevance, or user rating, or you can view them as pins on a map. The World Clock makes it easy to keep track of what time it is in other parts of the world. It displays up to 24 clocks at a time — and you can easily switch among three different clock types: two analogs and one digital. The app’s built-in database knows almost 200,000 populated places in more than 230 countries, so it’s very hard to stump. And it doesn’t hurt that the app’s day/night map and clocks are gorgeous.